Suzanne Rozdeba With city sanitation trucks busy plowing snow-covered streets, piles of trash have continued to accumulate in the East Village. Limited trash pickups are scheduled to resume today. 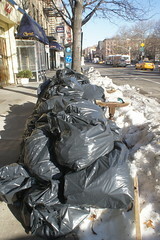 The snow is melting away, but the piles of trash in the East Village keep getting bigger. According to the Department of Sanitation, limited pickup resumed today. But as of this morning, residents and businesses that normally have Monday garbage pickups have yet to see the trash disappear. On Monday morning, Sanitation Commissioner John J. Doherty held a press conference at Foley Square and told reporters that 1,100 trucks would be picking up trash throughout the city on Monday. He estimated that about 50,000 tons of trash had accumulated since the storm. The pickups cannot come quickly enough for some East Villagers. But some East Villagers were unruffled about the pileups. “I’m not concerned. I’ve seen it before,” said Angel Shea, 54, who’s lived in the East Village for 30 years. And in at least one instance, the trash piles have been credited with doing some good elsewhere in the city, according to authorities. Vangelis Kapatos, 26, a resident of Hell’s Kitchen, was saved by a huge pile of garbage bags after leaping from his apartment window on the ninth floor of a building on West 45th Street Sunday. 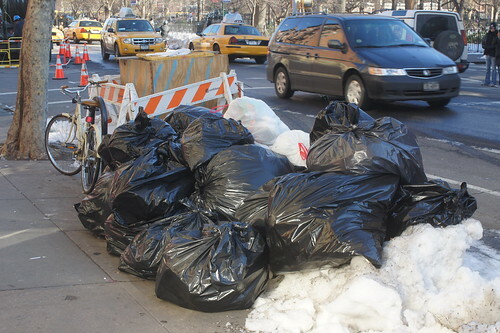 Although regular trash pickups are not expected to resume immediately in the East Village, some hopeful locals have continued to stack bags at the curb. Colin Moynihan contributed information to this report. Share your stories about trash collection at The City Room blog at The Times.